No cultural institution has currently engaged itself in helping refugees as intensely as has the German theatre. Alone the online portal nachtkritik.de compiled at the end of 2015 a list of some 80 initiatives. Yet refugees still appear only rarely as independent agents. Three years ago there still was here a Schlecker drugstore. Then the shop stood vacant and joined the bleak ranks of downtown Mülheim an der Ruhr. But since June 2015 the corner building with large windows has become a place of hope: the “Dezentrale” (Decentral), barely 400 metres from the main train station, is now a freshly renovated, airy space. A library is waiting for donations from the general public, the yellow-and-black university logo is emblazoned on the shop windows. Here in 2015, as part of the Impulse theatre festival, the Silent University opened its newest branch, whose existence has been assured until the end of 2016 by funds from the Federal Cultural Foundation. 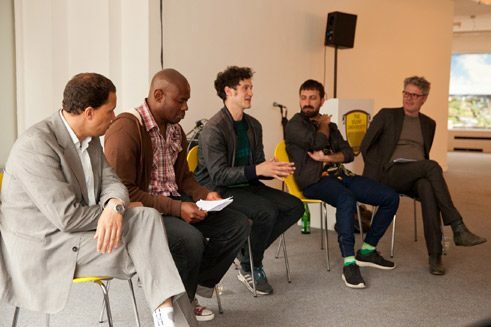 Florian Malzacher, Ahmet Öğüt, Markus Kressler, Patrick Ojibani (translator), Rachid Garnaoui (Consultant) (f.r.t.l.) at Impulse Festival 2015; | Photo: Robin Junicke The network for the disused knowledge of refugees had already been founded in 2012 by the Kurd conceptual artist Ahmet Öğüt at the Tate Gallery in London. Born in 1981 in Turkey, he now lives in Amsterdam. In 2009 Öğüt designed the Turkish pavilion at the Venice Biennale. In 2012 he had the idea of activating knowledge that had fallen silent because of war, flight or bureaucracy, and so to prevent doctors and engineers ending up as taxi drivers, building cleaners or in depression. His goal: “The exchange of knowledge and democratic education, which helps both the teachers and the students”. Since then branches of the Silent University have opened in Stockholm (2013), Hamburg (2014) and, since May 2015, in Amman, Jordan. It is part of the basic idea that the branches of the Silent University should act as autonomously and flexibly as possible. In Mülheim the Silent University’s activities are coordinated by Kirsten Ben Haddou, by training a qualified educationalist with an intercultural focus and experience in refugee work. In Hamburg the city curator Sophie Goltz is the artistic director. “We’re not a university in the traditional sense”, she explains; “here you can’t get any educational qualifications”. To online universities for refugees that make this possible, such as Kiron University, the Silent University has contacts, but hardly any similarities. Ahmet Öğüt (founder of Silent University), Sherko Jahani Asl (lecturer of Silent University Stockholm), Vera Grugel (assistant of Silent University) at Impulse Festival 2015 (f.r.t.l. ); | Photo: Robin Junicke At the opening in Mülheim, the social worker and native Iranian Hanif Hidarnejad, who now lives in Bochum, spoke about Germany’s failing to make use of valuable resources in its dealing with refugees. A few days later in June, the Iranian Behnam Igzeer, once head of the Christian-Catholic school in Bagdad, explained the secrets of Arabic calligraphy. A relic of distant times when Iran was associated with high culture and not immediately with the crimes of the Islamic State. It is the latter sort of automatic ascriptions that the Silent University wants to counteract. Kirsten Ben Haddou has already gathered four lecturers; every two months a lecture will be held; about fifteen so-called “consultants” form a network that also provides help with practical things such as the recognition of certificates and flat hunting. The search for lecturers, says Ben Haddou, was not easy. Although they receive fees and travel expenses, refugees are often too preoccupied with their daily cares and the search for real work to take part in other activities. “And often they come from professional groups that aren’t necessarily suitable for lectures”. Sophie Goltz says much the same: in Hamburg the discourse about refugees has changed drastically since September 2015. 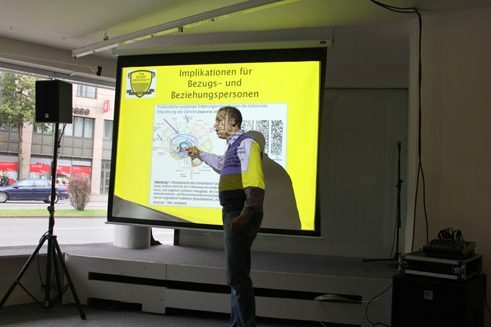 The Silent University therefore now also offers German courses, anti-bias workshops against mechanisms of discrimination and panel discussions, most recently one with Kilian Kleinschmidt, the former head of the Zaatari refugee camp in the north of Jordan and with Rwandan and Syrian refugees. “We’re finding more and more a hierarchy among refugees”, Goltz says, “and want with the Silent University especially to open spaces for their coming into contact with each other. Good social work is better than bad theatre? Rachid Garnaoui from Marocco, Consultant and lecturer of Silent University, psychologist/qualified social education worker; | Photo: Kirsten Ben Haddou Common to both German branches of the Silent University, however, is that they give refugees themselves a voice. This is often more than what happens at the 80 theatres listed by the online portal nachtkritik.de that provide direct help to refugees through a mixture of social and artistic work. These make collections, furnish shelter, debate, are visited and put things on stage. At the Deutsches Theater in Berlin refugees sleep every night in the wardrobe; the Schauspiel Köln has assumed the sponsorship of two refugee hostels, gives theatre courses for children and smartens up the hostel gardens. The Munich Kammerspiele is helping build a refugee hostel on the Viktualienmarkt, and of course it often puts refugees themselves on stage. Its engagement is extensive, and Matthias Lilienthal, the Artistic Director of the Kammerspiele, likes to reiterate the sentence: “I prefer good social work to bad theatre”. Still, the response of theatres to the refugee crisis has also called forth its critics: for instance, the German director Michael Thalheimer has said in an interview with the Wiesbadener Kurier that such social projects are nothing but vain poses and that with them the theatre is doing away with itself. And in fact, when you look at the list at nachtkritik.de, you are struck by how rare initiatives still are in which refugees have their own voices. But they exist: for example, the project Ruhrorter at the Theater an der Ruhr in Mülheim, where refugees themselves perform, stage and conceive theatre productions. Or Wir erzählen um unser Leben (i.e. 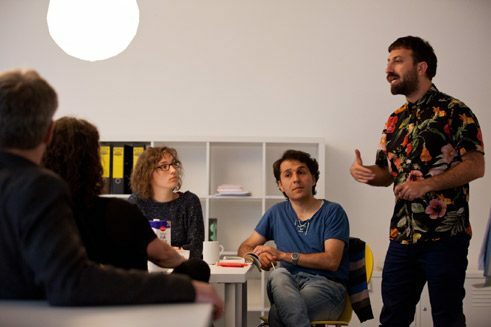 We Tell about Our Lives) at the Schauspiel Wuppertal, where Syrians put their stories of flight into words with the help of regional writers. Or again at the Theater Osnabrück, where the Syrian theatre-maker Anis Hamdoun has designed his own projects. There is still much to discover in the new country of immigration – Germany. Dorothea Marcus is a free-lance theatre critic for “Theater Heute”, Deutschlandfunk, WDR, “nachtkritik.de” and since 2016 member of the jury for the Berlin Theatre Meeting. Blog by Jonas Tinius: "The Ruhrorter Refugee Project"